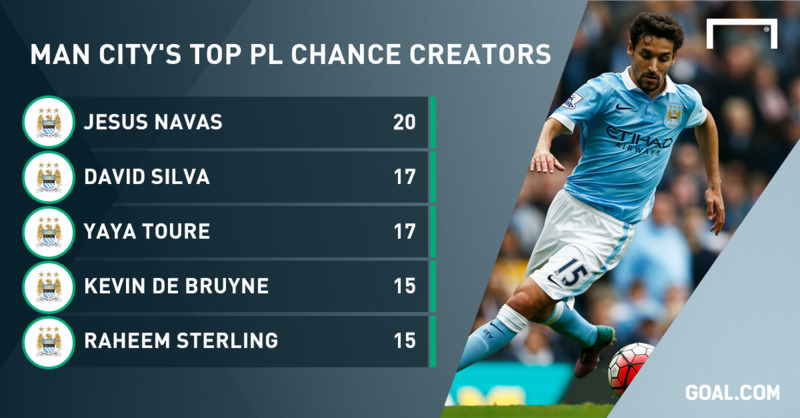 In little over two years at Manchester City, Jesus Navas has become one of the most divisive players of the club’s modern era. The strengths to his game which had attracted the eye of Manuel Pellegrini back in the summer of 2013 – when the Chilean made the pacey winger one of his first signings after taking over from Roberto Mancini – have, to some, become predictable and frustrating. Navas’ efforts in the shock home defeat to West Ham in September were even greeted with boos from some of the Etihad crowd. One City commenter felt compelled to defend the Spaniard, comparing his case to those of Javi Garcia, Fernando and, long ago, Richard Edghill, players who were all targeted by disgruntled supporters. But in his last two games he has bounced back, helping to turn the game when he came off the bench against Newcastle United, and after being named in the starting XI against Bournemouth on Saturday he wreaked havoc down the right-hand side, and picking up his second assist in as many games. With David Silva out of the team through injury, opening up one of the midfield positions behind the striker, Navas has been given yet another opportunity to endear himself to those remaining doubters and, on the latest evidence, is ready to take full advantage. As fate would have it, next up he faces his boyhood club, and in many ways his first love. Sevilla, the side at which he spent a decade after joining as a 15-year-old, are in town this week and for Navas it is an opportunity to show how far he has come. Having already rejected moves away from the Ramon Sanchez Pizjuan due to the love for his hometown, he finally elected to test the waters outside of Andalusia when he signed up for the Premier League revolution unfolding at the Etihad Stadium two years ago. Once prone to homesickness, he now says he is so relaxed in Manchester that he can hardly tell the difference between the two key cities in his life – save for one subtle change. If that might be a stretch of the imagination for holiday makers, one certain similarity is the two clubs’ Champions League form. With two games gone, they both have just three points to show for their efforts - having both lost to Juventus - and will meet each other twice in the next fortnight needing big results at home and away if they are to qualify for the last 16. Navas is careful to play down his ongoing support for los Rojiblancos and is, of course, desperate to help City make huge strides of their own in Europe, but is clearly excited at the prospect of lining up against his old side and particularly returning to the Pizjuan in two weeks’ time. Sevilla finished fifth in La Liga last season, missing out on a place in the Champions League qualification round on the final day of the campaign, and by just one point. But Unai Emery’s men were the first club to benefit from Uefa’s new mandate that the Europa League winners should be parachuted straight into the Champions League, meaning five Spanish teams will be represented at the top level of European football. As the Madrid clubs and Barcelona dominated at the top level in the past two years, Emery has led Sevilla to back-to-back Europa League titles for the second time in their history. Navas, who played in both successful finals in 2006 and 2007, has been keeping up with their latest exploits on television, and in person whenever he is back in Spain. “I was very happy. Seeing them grow year on year, doing well and now enjoying the Champions League – where they’ll get to know themselves better – pleases me a lot. “It’s not easy to win the Europa League and as I say now it’s another step for them and they will want to do something important. While City sit top of their domestic league – despite that defeat to West Ham and another shocker at Tottenham – Sevilla have had to claw their way back up the table after taking just two points from their first five games. That left them rock bottom and with more home defeats than they suffered in the entirety of last season, but Emery’s men have eased the pressure with two wins in their last three outings – including a 2-1 victory against Barcelona before the international break. But while Navas refused to rule out a return home later in his career – “nobody knows what will happen” - right now he is solely focused on helping Manchester City becoming part of Europe's elite. If he can keep up his recent good form and help put the Blues into the next round of the Champions League, he will have won around everybody at the Etihad. Even if he breaks a few hearts back home.